The new upgraded racksack made from tough waterproof polyester, the racksack can adequately withstand the rigours of an industrial environment. 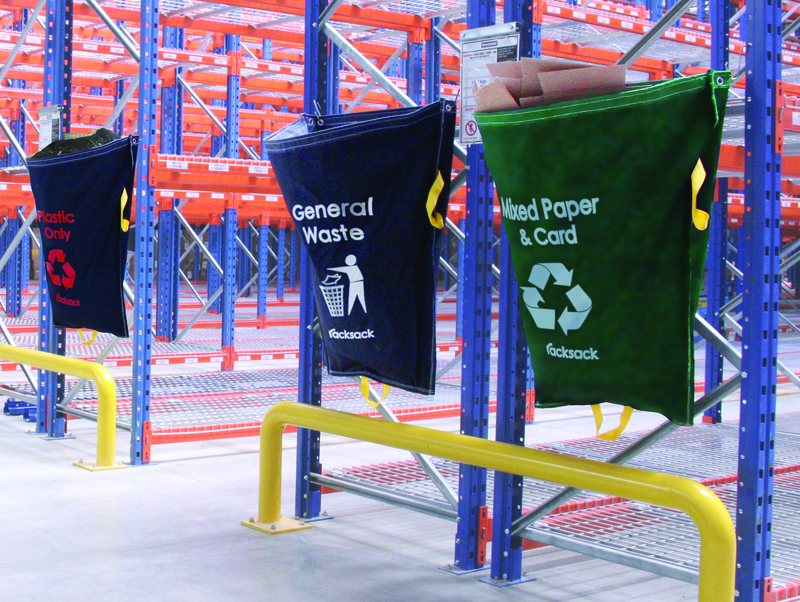 The re-usable waste sack helps promote a green and tidy work place suitable for racking systems between 900-1100mm deep. The new green coloured sack is available off the shelf in 3 designs General waste, Mixed card & Paper and Plastics only. Also available blank with no printing, special printing/designs including some logos can also be arranged. Green racksacks Waste management problems are easily solved with the racksack. Suitable for most warehouse racking systems, the racksack quickly fixes to the end of your racking system.The racksack is designed for most racking and shelving systems between 900mm and 1100mm. Once full, racksacks can be removed and emptied with ease.The racksack has been thoughtfully developed so that it will not intrude into valuable warehouse space. When hung it has a large open mouth to easily receive waste, yet its tapered design enables it to hardly encroach into the floor area.Originally designed for the warehouse the racksackÕs flexible method of ÔSÕ locator fixing means it can be hung over or hooked onto any substrate. ThatÕs why the racksack has quickly established itself a place in other industrial areas such as factories, offices or anywhere where waste has become a problem.Made from tough waterproof polyester the racksack can adequately withstand the rigours of an industrial environment.Three strong handles are woven into the edge of the sack, one on each side for carrying and one on the base, so that the can be easily tilted from the base and emptied.This new green coloured wastesack is available with 3 standard design options plus a completely blank sack. Dimensions: 1000mm high x 920mm wide.Special prints are available to order and can include company names, logos and other symbols etc – please contact our sales dept for further details.